The Department of Special Education, Rehabilitation, and Counseling prepares professionals for the communities of San Bernardino and Riverside counties and beyond. Our Education Specialist teaching credential and Pupil Personnel Services credential programs are accredited by the Commission on Teacher Credentialing (CTC) in California and the Rehabilitation Counseling program is accredited by the Council on Rehabilitation Education (CORE). The department offers Master’s degrees in Special Education, Counseling and Guidance, and Rehabilitation Counseling as well as the Education Specialist degree (Ed.S.) in School Psychology. Candidates in the Counseling and Guidance program may pursue preparation for the Licensed Professional Community Counselor (LPCC) in California through the Board of Behavioral Services (BBS) and candidates in the Rehabilitation Counseling Program are prepared to obtain national certification as a Certified Rehabilitation Counselor (CRC) through the Commission on Rehabilitation Counselor Certification (CRCC). Please utilize these web pages to browse our programs and our faculty to make informed choices about professional preparation in any of our programs. 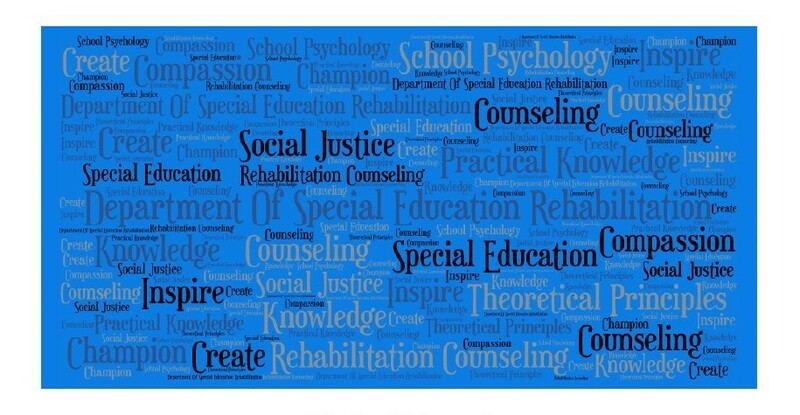 We prepare professionals to promote knowledge, social justice, and compassion through practice in special education, counseling, school psychology and rehabilitation counseling. Our goal is to inspire professionals to create adn champion practical knowledge and theoretical principles. The M.S. in counseling and guidance is a professional program preparing students to become educational counselors. The degree program is designed to fulfill all the California State requirements for counseling in grades K-12, so that a graduate will concurrently receive the M.S. and the California Pupil Personnel Services Credential. The M.A. rehabilitation counseling is designed to prepare students to work with individuals with disabilities in public and private rehabilitation agencies, hospitals, industry and related fields. The graduate program, a three-year course of study, will train students in rehabilitation counseling, vocational evaluation and job placement of persons with disabilities. Graduates of the program will be prepared to take the certified rehabilitation counselor examination. The School Psychology Program at CSU San Bernardino provides professional preparation for the Pupil Personnel Services Credential with Specialization in School Psychology. The program is designed to meet the mandates for the Pupil Personnel Services Credential in School Psychology (PPS) established by the California Commission on Teacher Credentialing (CCTC). The program is also designed to meet the national accreditation standards of the National Association of School Psychologists (NASP) as adopted in 1984 and revised in 2000. Note that the current program is revised to reflect the new standards of CCTC (2000) and NCATE, the national accreditation organization used by NASP. The Special Education program offers the Preliminary Education Special credential with authorizations in Early Childhood Special Education, Mild to Moderate disabilities, and Moderate to Severe disabilities. There are multiple options for completing the requirements for any of these credentials including the Education Specialist Internship option. The Master of Science (MS) in Special Education provides students with advanced preparation in research methodologies and research­ based practices that address contemporary topics and issues in the field of Special Education. The MS in Special Education overlaps significantly with the coursework and field experiences required in Education Specialist credential program.